Bakumatsu Kikansetsu Irohanihoheto is set within the last days of the Shogunate, during the Bakumatsu era and is a mix of the historical, action, adventure and supernatural genres. It follows swordsman, ronin and once-bodyguard of Sakamoto Ryouma, Akidzuki Youjirou as he attempts to seal a (supernatural) item known as the Lord’s Head, with his story being played out against the backdrop of history. What is noticeable from the first few minutes of Bakumatsu Kikansetsu Irohanihoheto is its extremely fluid and detailed animation. 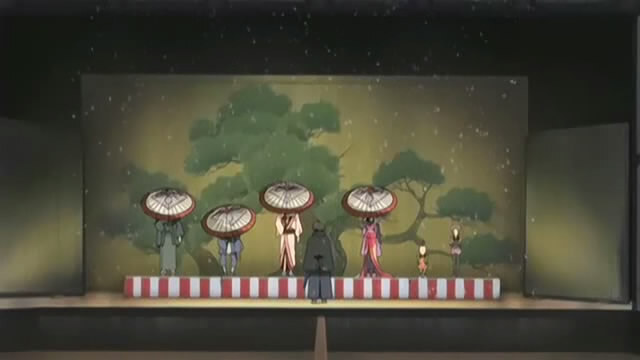 One of the aspects that I appreciate the most about this series is its attention to detail; the mode of speech of the kabuki actors, the style of the opening and ending (though, despite the ending theme with such lines as “As long as this love remains”, the series contains a minimal amount of romance), are all in concordance with each other and the general tone of the series. Another of the series’ stronger aspects is its characterization. Despite the epic scope of Bakumatsu Kikansetsu Irohanihoheto, the characters seemed very human and very real. When saying this, I think of such epics as Narnia (while The Lord of the Rings may seem like a prime example, it cannot be truly valid as this effect was probably intended by Tolkien writing in high fantasy) where the characters at time seem distant or unreal. The main character Akidzuki instead is portrayed more so as a young man driven by purpose, duty and at times, confusion too, rather than than the dark, mysterious warrior that would normally accompany the title ‘The ‘Eternal Assassin’. Another example is with Ibaragi Soutetsu, mysterious playwright and would-be writer of history, yet at the same time, he too seems to be bound by destiny. [Spoilers ahead] However, however, the series seems to falter in the last few episodes. Perhaps the writers, after thinking of the great plot twist in episode 18, had exhausted their capabilities. The last machinations in the series are dull and unoriginal – the Head begins to possess as many people as it can, a possessed Kakunojou performs propaganda with a possessed Kanna blindly following, steel walls form around a fortress in a matter of minutes and the said fortress then rises up into the sky with the help of several more supernatural beings. There is then the usual fight scene between your protagonist and antagonist, where the protagonist wins and order is restored. The ending of the series left me wondering why all the historical background and details were needed at all if it was to end as it did. The way it dealt with several characters is also highly unsatisfactory, especially in the case of Kanna, who after little substantial character development, is then possessed by the Head and killed. There is again the question of ‘why was he/it necessary in the first place?’ The above average set up of the plot and characters in the earlier episodes seems to have been wasted. The main failing of Bakumatsu Kikansetsu Irohanihoheto is this lack of development. Apart from that, there are still many features that distinguish it from the usual hack-slash-action-samurai series that are out there, and it is still worthwhile to watch (which I say now after completely spoiling the ending and perhaps any interest in it, as well). The details and nuances in the earlier part of the series perhaps compensate for its unsatisfactory ending. What does Bakumatsu Kikansetsu Irohanihoheto mean – aside from ‘very long and difficult to remember’? An alternative translation of the second line is ‘For none in this world last forever’. So if the meanings of each of the sections were paraphrased, the title would read something like this: end of [the Shogunate] era-absolute power-nothing lasts forever. The first two sections of the title are concerned with history and power, yet the message given by the third and final section of the title is ‘all fades, nothing is eternal’ which is in direct opposition to the first two sections of the title. Although the message of ‘in the end nothing matters’ that is possibly conveyed by the title is an interesting idea, it does not seem to really apply or appear in the series. Perhaps it is more so the idea of the opposition and interaction between the forces of power, violence and change and peace and serenity, which is seen in parts in the series. Ok, ok. I truly love this iroha uta. I admit that this is my favourite translation of it and I think it’s absolutely brilliant how a person could create something so meaningful by using all 46 syllables only once. On a completely different topic, because I’m too lazy to make two comments.. your story ‘Desirée’ is quite interesting. But since i’m quite doltish at times, I feel like I don’t have adequate understanding of the story to really comment. So this really is a non-comment comment. thanks for breaking down the title for us…i’ve always wondered what it all meant. lol wow. i think one can lull over Iroha Uta for a very, very long time. the honorable Kukai was truly a mastermind!